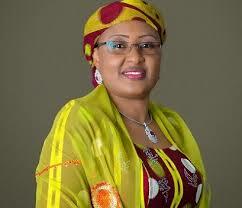 Wife of the President, Mrs. Aisha Buhari has appealed to the ruling party, All Progressives Congress (APC), not to renege on its campaign promise of paying N5,000 to 25 million unemployed Nigerians and giving school children one free meal a day. A statement by Adebisi Olumide Ajayi, the Special Assistant to Mrs Buhari, said the comment by the wife of the President became imperative after the senators from the party voted against the Senate moving a motion calling on the Presidency to pay the N5,000 allowance. Speaking further, Mrs Buhari who described the APC as ’a party of integrity’, affirmed that the APC had assured Nigerians during the campaign that it would pay 5,000 Naira each month to 25 million most vulnerable citizens. The issue of the N5000 stipend, along with the free meal-a –day campaign promises by the APC has pitched the ruling party against the opposition Peoples Democratic Party, PDP, of recent. The Senate, last Wednesday, dramatically rejected a motion for the payment of N5, 000 monthly allowance to unemployed youths in the country. The motion was sponsored by Philip Aduda (PDP, FCT) but was greeted with shouts of “no, no” when he tried to explain it, even as attempts by the Minority Leader, Godswill Akpabio, to second the motion were disrupted by the rowdiness. Intervening, President of the Senate, Bukola Saraki, posed the question but the senators responded along party lines. While PDP members yelled ‘’aye’’ in favour of the motion, APC senators, who are in majority, rejected it. In his remarks, Senator Saraki urged the senators to take the issue of unemployment very seriously and not play politics with it. “We should stay above party lines on this issue that is so important. We have seen growth in the last years but this has not translated to employment. “Government alone cannot do it; the private sector has a role to play and the enabling environment must be created,” he said. PDP leaders have lately called on President Muhammadu Buhari and the ruling APC to fulfil their campaign promise of paying N5, 000 to unemployed Nigerian youth. The motion on Wednesday is believed to have been part of that call. “The PDP declares that it is absolutely obvious to all that the APC came to power riding on monumental lies and deceit in making promises they had no intentions to keep. All they wanted was to get into power and they achieved this with their lying tongues,” Metuh said. On its part, Human Rights Writers Association Of Nigeria (HURIWA), last Friday, told President Buhari to fulfil his presidential election campaign’s social contract with millions of unemployed Nigerians by commencing the payment of monthly stipends and allowances to cushion the astronomic high cost of living which is pushing many youth to the life of crime and violence. Besides, the Rights group said the President should not hide under any legislative cover to fail to implement the payment of N5, 000 monthly stipends to millions of unemployed youth in Nigeria since it was a solemn campaign promise the President made directly to the Youth which convinced millions of youthful voters to cast their votes for the President in the hotly contested Presidential election. In a statement signed jointly by the National Coordinator Comrade Emmanuel Onwubiko and the National Media affairs Director, Miss Zainab Yusuf, HURIWA condemned the Senator Bukola Saraki -led APC dominated Senate for standing between millions of jobless Nigerians and their eventual success in drawing from the National Unemployment Fund that ought to have been set up by President Buhari following his success at the polls in which he canvassed the introduction of the payment of monthly stipends to unemployed Nigerians. The ruling APC has, however, moved to re-assure Nigerians that it will not renege on its campaign promise to pay the 5,000 Naira each monthly to 25 million most vulnerable Nigerians, while calling on citizens to ignore the attempt by the PDP to confuse and mislead them on the issue. It said the non-implementation of the payment policy so far is due to the fact that it was not included in the 2015 budget, which was prepared by the PDP-led Jonathan Administration, and also because of the need to first block all financial leakages.